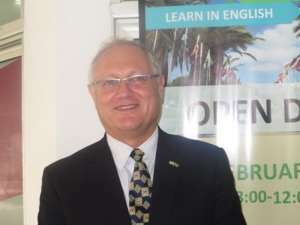 The Israeli Embassy in Ghana has held an education fair in Accra to provide an opportunity for Ghanaian students to find out more about study programmes in Israel. The fair, which was opened by Mr Ami Melh, the Ambassador of the State of Israel to Ghana saw seven Israeli Universities participating. The Ambassador said the objective of the programme was to present to Ghanaian students the possibilities of studying in Israel in English and acquiring high quality education. He said helping to train Ghanaian students in Israel was part of his country's contribution towards Ghana's socio-economic development. He said it was their expectation that Ghanaian students, after their training, would return home to contribute to Ghana's development. Israel is home to 66 institutions of higher education, which consist of seven research universities, one Open University, 23 teachers training colleges, 21 academic colleges and 14 private colleges.